On the Astrology of the Black Madonna of Czestochowa. Aries with Leo and the stimulative factors of Poland`s most famous catholic pilgrimage site. Jasna Góra (engl: “Bright Mount”)- the fortified monastery of the Pauline Fathers in Czestochowa Poland was founded in 1382. 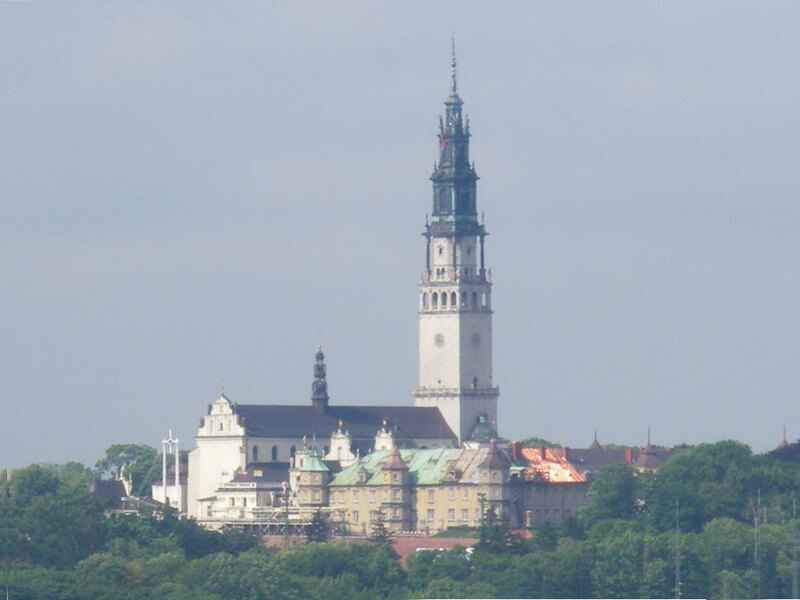 The monastery with the famous icon of a Black Madonna is considered the spiritual capital of catholic Poland, the country`s most important pilgrimage site and one of the top 5 catholic pilgrimage places in the whole of Europe. Between 3 and 4 million prilgrims visit the shrine each year. Astrogeographic position for morphogenetic field level 3 which describes the energetical situation of the whole fortress with the monastery: the coordinate for the astrogeographical longitude stretches between highly alert, defensive, solid, fiexed water sign Scorpio the sign of fortresses, strongholds, sculptures, imaging, vosualization, hierarchy and dogma and highly dynamic fire sign Sagittarius sign of shamanism, priest castes, philosophy, thinking, observation, travelling, preaching, initiation, expansion, luxury, harems, hell and an important indicator for the fire element in healing. Scorpio stands for the fortress built around the monastery and for the compact architectural design of the church. The astrogeographic position in Sagittarius the sign of black colour may be understood as a resonance with the black colour of the Madonna. The 2nd coordinate lies in the center of air sign Gemini sign of sign posts, symbols, bridges, language, learning, intelligence, communication, information, practical magic, road crossings and bringing opposites together. Due to its combination with Sagittarius the position in Gemini – actually the same combination as in the case of Stonehenge sanctuary – stands for the function of the site as a school for priests especially in regard to practical knowledge about magic, preaching and the wording of prayers. The Black Madonna of Częstochowa icon has been a symbol of the political independence and military and other protection of Poland for 600 years. It is believed to have miraculously saved the monastery of Jasna Góra from a Swedish siege between 8 November to 27 December 1655. 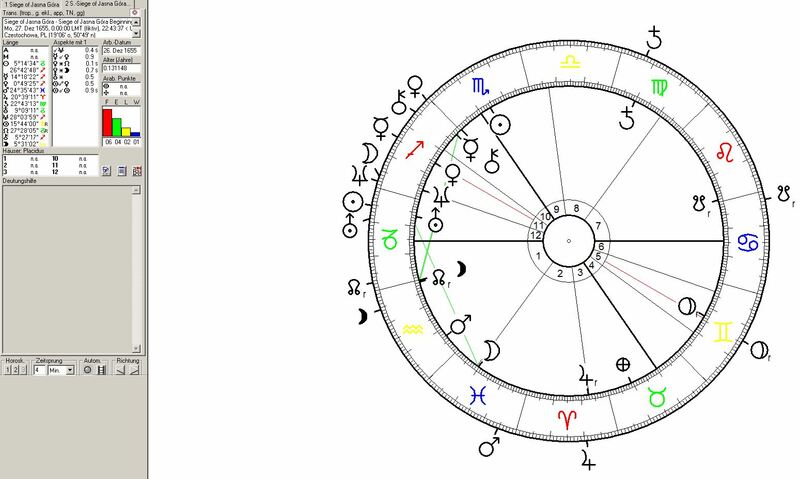 The chart showed that a spectacular opposition from Venus at 15° Sagittarius which through the opposition to the astrogeographic position of the Jasna Góra fortress stood for the attacking forces. As the sign of shooting Sagittarius related to the Swedish cannons that were applied during the siege. Venus as indicator for wealth and for food supplies Venus`s opposition from Sagittarius also indicated the attackers hunt and desire for looting. On 9 Nov. a day after the siege of Jasna Góra was begun Venus turned retrograde and kept that direction until 20 Dec reflecting a period of lack of supplies on both sides of the fortress walls. During the siege Pluto the ruler of the astrogeographic position in Scorpio and resonator of the defense system was stationary at 15°Gemini conjunct the Gemini coordinate of the astrogeographical position of the Jasna Góra fortress. This strongest possible Pluto support of ther defense system of the place appears to have been a stabilizing factor for the fortress here. The Siege was ended just in time before the Sun could reach the exact conjunction with Uranus the planet of deserters 2 days after christmas. That position can be understood to have caused the attacking swedish army to flee the winter and austerity. 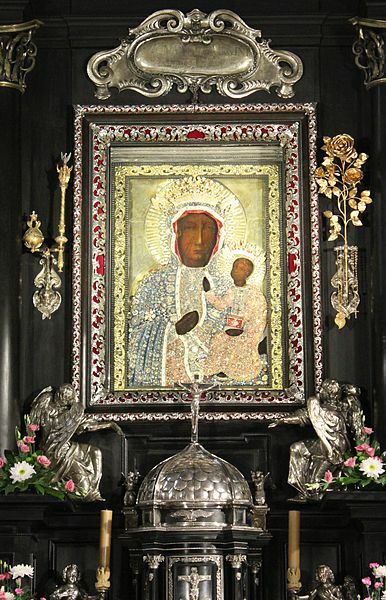 The icon of the Black Madonna of Częstochowa a four-foot-high painting in the style of 6th to 9th century byzantine tradition. It depicts the Virgin Mary wearing the fleur-de-lis robes in what is called the “Hodegetria” (“One Who Shows the Way”) pose. The Virgin directs attention away from herself, gesturing with her right hand toward Jesus as the source of salvation. In turn, the child extends his right hand toward the viewer in blessing while holding a book of gospels in his left hand. Compare also the wiki article on Marialogy. Astrogeographic position of the Vasilica of St. Mary`s Ascension for morphogenetic field level 4 which describes the stmosphere and energetical topics of the basilica and place of the Black Madonna itself: both astrogeographical coordinates fall in fire signs – which explains the energetical and healing impact of the shrine as through stimulation and activation. One lies in dynamic, male fire sign Aries sign of action, speed, warfare, fighting, ignition, new starts, mobilization and sports. Aries is symptomatic of the traditional use of tribal shrines for initiation of new processes, stimulation of activity, exorcism of old energies, supporting courage for the beginning of any undertakings esp. going to war. For this function of saced sites in Aries compare the role of the Oracle of Delphi (Aries- Libra) for any topics of warfare in ancient greek history. The second coordinate lies in highly energetic, magnetic. self-centered, royal fire sign Leo the sign of the Sun, light, the heart, gold, self-esteem, the right for emotional self-expression, sexuality, power plants and kingdom. Similar to Aries Leo at its best has an intense stimulative effect that can support self-centeredness and motivation. Leo`s potential is to put the awareness for one`s emotional as well as mental perception of the present moment back into light.